Enuanị, Ngwa, Ohuhu, Ọnịchạ, Bonny-Opobo, Ọlụ, Owerre (Isuama), et al. ↑ Heusing, Gerald (1999). 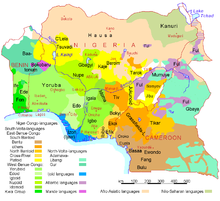 Aspects of the morphology-syntax interface in four Nigerian languages. LIT erlag Münster, 3. ISBN 3-8258-3917-6. ↑ "World Directory of Minorities and Indigenous Peoples - Equatorial Guinea: Overview". UNHCR. 20 May 2008. http://www.unhcr.org/refworld/country,,MRGI,,GNQ,,4954ce2a2,0.html. Retrieved on 2012-12-18.